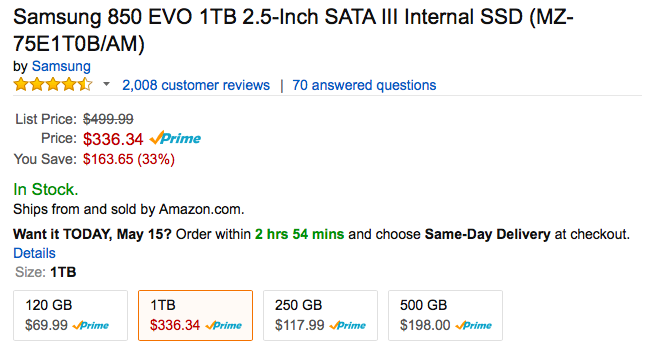 Amazon offers the Samsung 850 EVO 1TB 2.5-Inch SATA III Internal SSD (model MZ-75E1T0B/AM) for $336.34 with free shipping. This drive originally sold for $500, but now usually sells for $380 or so. Today’s deal represents the lowest price we’ve ever seen. Over 2,000 Amazon customers rate it a near-perfect 4.7 out of 5 stars. Need a small SSD and don’t mind going refurbished? Crucial sells its 128GB m4 for just $29 with a one year warranty.